The first phase to distribute three-wheelers to war heroes organized by the Ranaviru Seva Authority was held under President Mahinda Rajapaksa’s patronage at the Army grounds yesterday. Picture by Nalin Hewapathirana. The UPFA has fielded the strongest team of candidates covering all social strata aiming to obtain a two thirds majority mandate at the upcoming general election, Education Minister and United People’s Freedom Alliance (UPFA) General Secretary Susil Premajayantha said. Twenty one UPFA candidates handed over nominations yesterday to Gampaha District Secretary and Gampaha District Returning Officer P.A. Abeysekera under the leadership of Senior Presidential Advisor Basil Rajapaksa to contest the April 8 General Election. 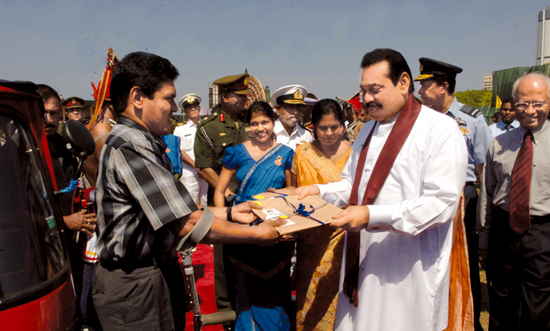 President Mahinda Rajapaksa yesterday handed over 100 three-wheelers to 100 disabled war heroes at the Army Grounds in appreciation of their valuable service to safeguard the unity of the country and free it from terrorism even sacrificing their limbs. AmCham President Moji Akingbade handing over the first copy of the membership directory to American Ambassador Patricia A. Butenis. - Picture by Saliya Rupasinghe.